After the directive from Delhi and Karnataka Government to ban the surge pricing came into effect, the cab-aggregators Ola and Uber were quick to comply with them. Although once the odd-even rule in Delhi got over, Uber was quick to introduce it back to have more supply on road for its customers. Such services follow the demand vs. supply theory where in case of higher demand and low supply, the prices increase by a certain x amount. This latest fever seems to have caught the food delivery startup based in Bengaluru, Swiggy. It recently clocked more than a million orders in April, which also summarized why they’re the first ones to introduce surge. The company is trying to experiment by adding an extra fee, or as we call it surge, to customer’s orders to provide ‘incentives’ to delivery guys to deliver at odd-times or during peak hours. It is basically the same model as Uber, where the added cost will be delivered to the delivery folks and incentivize them to work more for delivering food. The extra amount however, unlike the way cab-aggregators apply, will be a flat fee added to the total order. Currently running as a pilot in Bengaluru and Hyderabad, the company plans to expand the surge pricing to other cities like Delhi, Gurgaon, Mumbai, Pune, Kolkata, Pune and Chennai. What is the need for surge in food delivery? From the point of view of a customer, I am already buying the food items keeping in mind a minimum order value set by Swiggy, along with which I will be paying the delivery charge. I also understand that during lunch and dinner times, the order volumes will exceed expectations which means the restaurants will be extremely busy. But let me put your apprehensions to rest by a statement from the company. The revenue generated from surge fee will be passed on to the delivery executives, so Swiggy’s revenue model remains the same for now. The move should be welcomed by everyone considering the fact that Swiggy guarantees delivery on national holidays and festivals. Now it boils down to a simple question, Would you mind paying a little more for fresh food on such occasions or you’d rather stock up from the previous day and re-heat? If the second option works for people out there, then you wouldn’t care. But spending a little more to get food delivered fast even during heavy rains is a big deal, and Swiggy should be lauded for it. Let us know your views on this new tact in food delivery industry in the comments section below. 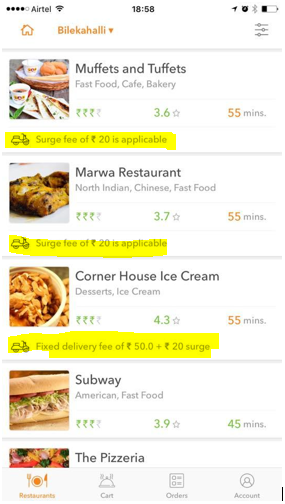 Have a surge pricing on every job in world, no matter what you do, add surge price to it. In this way everyone will get surge price based upon nature of their job and they wont mind spending it on other services. Is this surge all the time, or only on holidays? If it is only on holidays who cares, that is not offen enough to be an issue. If it is every day at lunch, it is the same garbage as normal surge and should be banned. Proof that Trak.in has gone pathetic over few days. Its Not restaurant folks. They’re passing it on to delivery guys.